Give your kids 5 minutes a week and they will be financially fit for the rest of their lives! 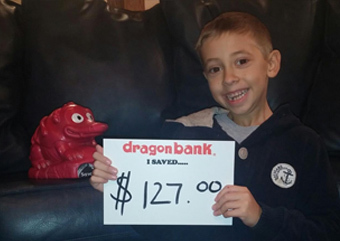 Dragon Bank is the only bank that comes with a free app designed just for kids! 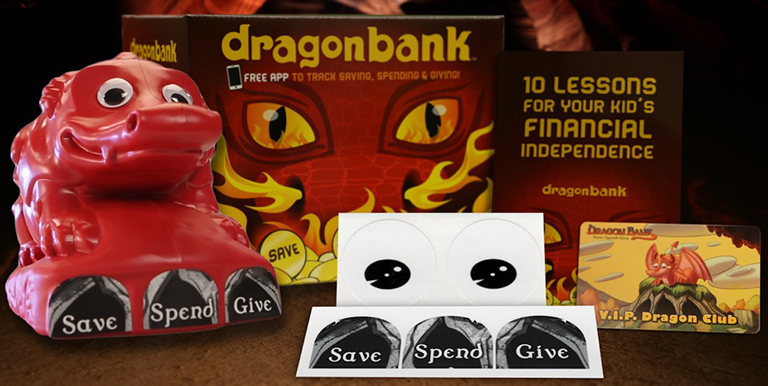 Dragon Bank teaches kid fun, valuable lessons about how to manage their own money. Most parents realize that it is important to teach their kids about money, but they don't make the time to do so. It is simply easier to give our kids money when they ask and let them spend it whenever they want. The problem is that kids never learn to save money, nor do they experience the benefits of giving their own money to important causes. 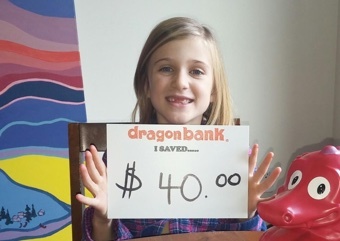 With Dragon Bank, parents and kids have an incredible new tool for learning valuable and important habits at an early age that will help keep kids financial fit for the rest of their lives! 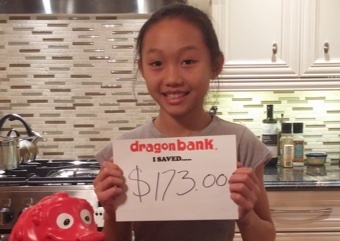 "I Saved $100 with my Dragon Bank!" "I bought this bike with my own money." "I gave $25 of my own money to the animal shelter"
"I saved $82.43 and used some of it to buy my sister a stuffed animal for her birthday." 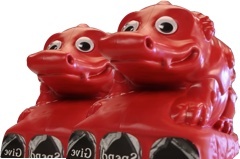 "I saved $193.99. That is so much money!!!" "I saved $127 and am going to get a dirt bike"
"I saved $206.18 and am going to keep saving for something I really want later." 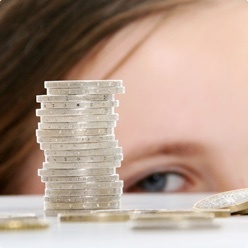 SET GOALS with your children and decide how much of their money they will spend, save or, give to charity. Watch it all grow! 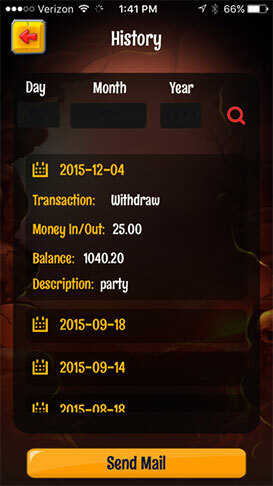 CHECK ANYTIME how much money your kids have to spend, save, or give to charity. 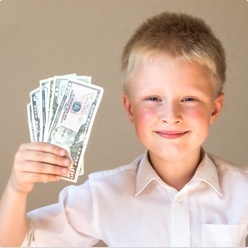 CREATE A WISHLIST of things your kids will buy with their own money. 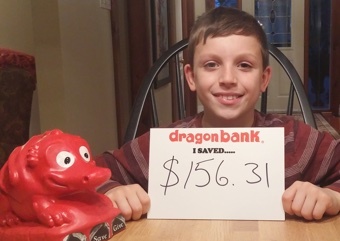 TRACK THE MONEY your kids have in their Dragon Bank, know where it came from, and what they have done with it in the past. 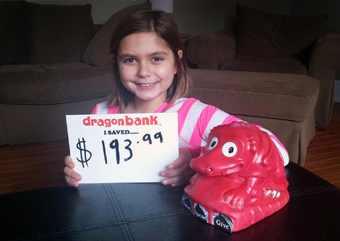 Personalize your Dragon Bank with stickers, markers or any other craft supplies! 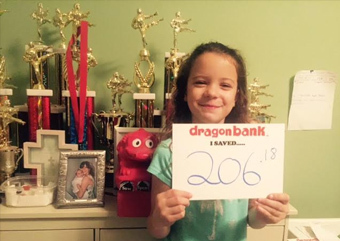 When kids decorate their Dragon Banks and name them, they have so much fun developing excellent habits that will be important their whole lives! 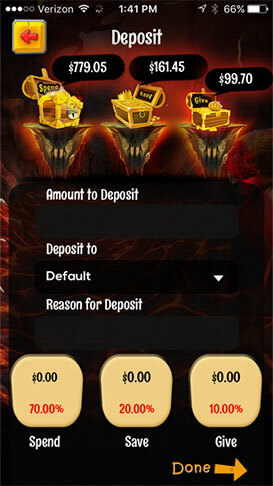 Using the Dragon Bank is easy! Just 4 Simple Steps. 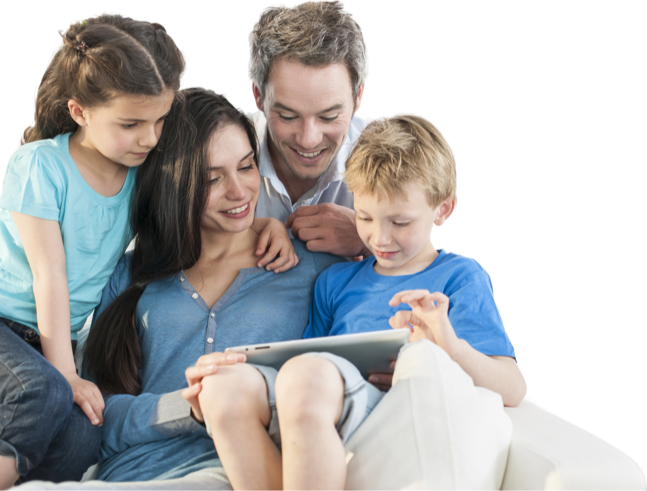 Create an online profile with your kids and decide what percentages of their income (allowance, birthday money, etc.) 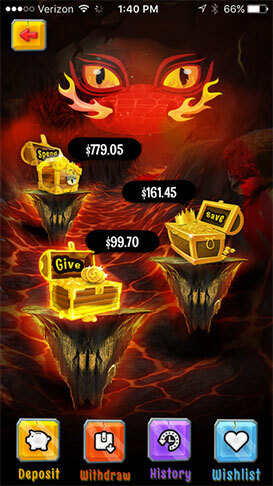 they will put into the Dragon Bank's three dungeons: Save, Spend, Give. This takes about 5 minutes, and creates alerts for the parents. 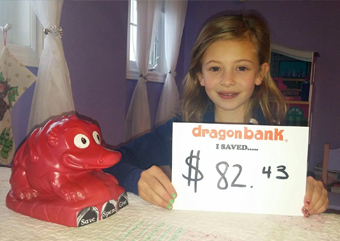 Make sure that your children track all money that they put money into or take out of their Dragon Bank. This is extremely important for creating responsible habits. Make 5 minutes a week to review your child's financial situation, and discuss how much money they have saved, what are their goals, etc. Have fun! Many parents and kids tell us that they look forward to these 5 minutes every week! 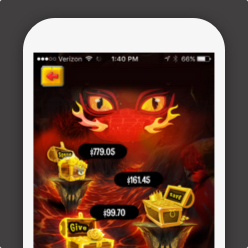 Free app to track saving, spending & giving! 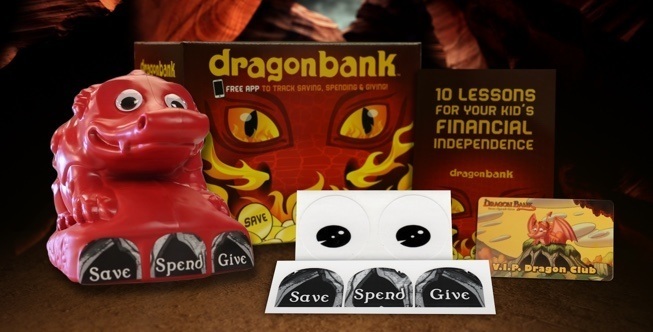 1 "10 Lessons for Your Kids' Financial Independence"
©2016 Dragonbank. All Rights Reserved. PLEASE CAREFULLY READ THESE TERMS AND CONDITIONS OF USE (collectively with any amendments hereto, "TERMS AND CONDITIONS"). BY USING THIS WEBSITE YOU AGREE TO BE BOUND AND ABIDE BY THESE TERMS AND CONDITIONS AND ANY AMENDMENTS THERETO, AND AGREE THAT YOU ARE AT LEAST 13 YEARS OF AGE AND ELIGIBLE TO USE THIS SITE AND PLACE AN ORDER FOR LAUNCH PAD LLC'S PRODUCTS AND SERVICES. IF YOU ARE 13 TO 17 YEARS OF AGE, YOU MUST USE THIS SITE AND/OR PURCHASE AND USE LAUNCH PAD LLC'S PRODUCTS OR SERVICES ONLY WITH THE INVOLVEMENT OF YOUR PARENT OR GUARDIAN. IF YOU DO NOT AGREE TO THE TERMS AND CONDITIONS, PLEASE DO NOT USE THE SITE OR ORDER OR USE LAUNCH PAD LLC'S PRODUCTS OR SERVICES. We may update or amend these Terms and Conditions from time to time to comply with law or to meet our changing business requirements without notice to you. Any updates or amendments will be posted on the Site(s). 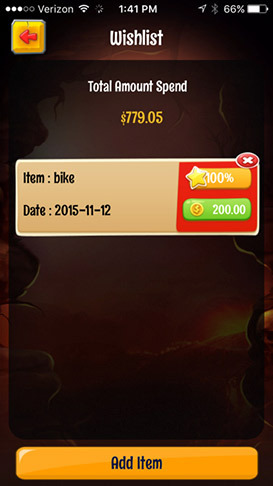 The Terms and Conditions displayed on the Site(s) at the time the order is accepted will apply to the order. 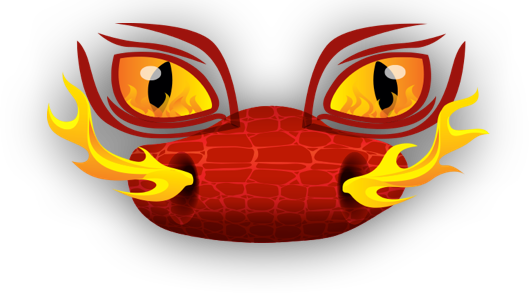 Welcome to the Web site(s) of LAUNCH PAD LLC'S (including www.savelikeadragon.com). These Terms and Conditions govern and apply to your ("you" or "your") access to and use of the Site(s) and their related domains on which these Terms and Conditions appear, any order you place through any of the Site(s), an-as applicable-your use of other products or services of Launch Pad LLC. You must read these Terms and Conditions carefully before placing an order or using the Site(s). By using the Site(s), and/or placing an order through the Site(s), you confirm that you have read, understood, and agree to these Terms and Conditions in their entirety. If you do not agree to these Terms and Conditions in their entirety, you must not order any product or service through or otherwise use the Site(s). The Terms and Conditions may be changed in the future without further notice. Your continued use of the Site(s) and/or other products or services of Launch Pad LLC after any such changes constitutes your acceptance of the new Terms and Conditions. These Terms and Conditions apply to your access to and use of the Site(s), any order you place through any of the Site(s), and to all products and services we supply, produce, distribute, or market. To the extent of any express inconsistency with any other agreement you may have with Launch Pad LLC for products, services, or otherwise, that other agreement shall prevail unless otherwise explicitly stated therein. If these Terms and Conditions refer or relate to a clause that is not part of that other agreement, then these terms shall apply therein as well, if you are a user of the Site(s). If you register for our digital site, Launch Pad LLCpower.com, additional rules, policies, and disclaimers may apply. to be bound by the Product Submission Policies of Launch Pad LLC, including that any product submission you may make to Launch Pad LLC will not be held in confidence by Launch Pad LLC, and is not proprietary, that Launch Pad LLC may use the product submission and any aspect thereof for any purposes in Launch Pad LLC's sole discretion, and that Launch Pad LLC owes no duties or obligations with respect to you or the product submission made. In addition, you agree that you will comply with all applicable local, national, and international laws and regulations that relate to your use of or activities on the Site(s). We will not be responsible, or liable to any third party, for the content or accuracy of any materials posted by you or any other user of the Site(s). We have the right to remove any material or posting you make on the Site(s) if, in our opinion, such material does not comply with the content standards set out in these Terms and Conditions. In the event that you upload any photographs, comments, video clips, or other media to the Site(s) (the "Uploaded Content"), Launch Pad LLC has the exclusive right to use any and all such elements of the Uploaded Content in connection with and/or as part of its business, including in connection with and/or in any advertising in any and all media, including, without limitation, product packaging, printed publications, presentations, promotional materials, events and associated marketing materials, television and cinema commercials, videos, or Web site(s), in perpetuity throughout the world as Launch Pad LLC in its sole discretion sees fit without further consent or payment. Launch Pad LLC has all right, title, and interest in any and all results and proceeds from such use of the Uploaded Content. Launch Pad LLC has the right to transfer the aforementioned rights to use the Uploaded Content to any third party, including, but not limited to, any of its subsidiaries or affiliated companies. Launch Pad LLC may alter, adapt, or edit the Uploaded Content and any further material created under these Terms and Conditions, and market and exploit it entirely at Launch Pad LLC's sole discretion. Launch Pad LLC is not obliged to make any use of the Uploaded Content or exercise any of the rights granted by these Terms and Conditions. Launch Pad LLC may, in its sole discretion, terminate, change, modify, suspend, make improvements to, or discontinue any aspect of the Site(s) or any products available through or outside of the Site(s), temporarily or permanently, including the availability of any features of the Site(s) or access to any parts of the Site(s), at any time without notice to you, and you agree that Launch Pad LLC shall not be liable therefor. Launch Pad LLC makes no claim or representation regarding, and accepts no responsibility for, the quality, content, nature, or reliability of site(s) accessible by hyperlink from the Site(s), or site(s) linking to these Site(s). The linked site(s) are not under the control of Launch Pad LLC, and Launch Pad LLC is not responsible for the content of any linked site or any link contained in a linked site, or any review, changes, or updates to such site(s). The inclusion of any link does not imply affiliation, endorsement, or adoption by Launch Pad LLC of the site or any information contained therein. When leaving the Site(s), you should be aware that Launch Pad LLC's Terms and Conditions and policies no longer govern, and therefore you should review the applicable terms and policies, including privacy and data-gathering practices, of that site. All the Site(s)' materials, including, without limitation, all Launch Pad LLC product logos, design, text, graphics, software, other files, and the selection and arrangement thereof (the "Content") are Copyright © Launch Pad LLC. ALL RIGHTS RESERVED. Unless expressly stated otherwise, Launch Pad LLC or its suppliers or licensors own and retain other proprietary rights in all products available through the Site(s). Except as stated herein, none of the Content may be copied, modified, reproduced, distributed, republished, downloaded, performed, displayed, posted, transmitted, sold, or made into derivative works in any form or by any means, including, but not limited to, electronic, mechanical, photocopying, recording, or otherwise, without the prior written permission of Launch Pad LLC or the respective copyright owner. You may not, without the express written permission of Launch Pad LLC or the respective copyright owner, (a) copy, publish, or post any materials on any computer network or broadcast or publications media; (b) modify the materials; or (c) remove or alter any copyright or other proprietary notices contained in the materials. You also may not (a) sell, resell, or make commercial use of the Site(s), its content, or services or products obtained through the Site(s); (b) collect and use of any product listings or descriptions; (c) make derivative uses of the Site(s) or its Content; or (d) use of any data mining, robots, or similar data gathering and extraction methods. You are not conveyed any right or license by implication, estoppel, or otherwise in or under any patent, trademark, copyright, or other proprietary right of Launch Pad LLC or any third party. Trademarks: Launch Pad LLC is a registered trademark of Launch Pad LLC. It is Launch Pad LLC's policy to respect the copyright and intellectual property rights of others. Launch Pad LLC may remove content that appears to infringe the copyright or other intellectual property rights of others. In addition, Launch Pad LLC may terminate access by users who appear to infringe the copyright or other intellectual property rights of others. Further, Launch Pad LLC complies with the Digital Millennium Copyright Act. You agree to indemnify and hold harmless Launch Pad LLC, its parents, subsidiaries, shareholders, officers, directors, employees, agents, and suppliers from any claim, action, demand, loss, or damages (including attorneys' fees) made or incurred by any third party arising out of or relating to your use of the Site, your violation of these Terms and Conditions, or your violation of any rights of a third party. For questions about the products or services on this Site, please use the Customer Service email links found on each product page or section. For questions about orders placed through the Site(s) or otherwise, please contact the customer service number shown on this site. All of our products carry a specific money back guarantee, return or exchange policy starting from the date that the product is delivered to you. Please review the information provided with your product for specific details. To return or exchange a product, please call our Customer Service at 1-877-444-3776 Monday-Friday between 8:00 AM and 8:00 PM Eastern time and Saturday 9:00 AM to 6:00 PM Eastern time. for a Return Authorization Number and return the product within the required time period specific to your product. Products that come with a moneyback guarantee will receive a refund of the purchase price, less any applicable shipping and handling. We will not be responsible for any loss or damage to returned products that occur in transit. If returned products are lost or damaged in transit, we reserve the right to charge you for, or not refund any amounts attributable to, such products or loss or damage. If you use the Site(s) or other means to purchase a product, payment must be received by Launch Pad LLC prior to Launch Pad LLC's acceptance of an order, unless otherwise agreed by Launch Pad LLC. All Launch Pad LLC products are subject to sales tax which will be applied to your order total. Launch Pad LLC may need to verify information you provide before Launch Pad LLC accepts an order, and may cancel or limit an order any time after it has been placed. If payment has already been made and your order is cancelled or limited, Launch Pad LLC will refund any payment you made for the product that will not be shipped due to cancellation or limitation of an order in the same tender as the original purchase. Launch Pad LLC expressly conditions its acceptance of your order on your agreement to these Terms and Conditions. In ordering products through the Site(s) or otherwise, you agree to provide only true, accurate, current, and complete information. You hereby certify that any email account you provide to Launch Pad LLC is registered to you. 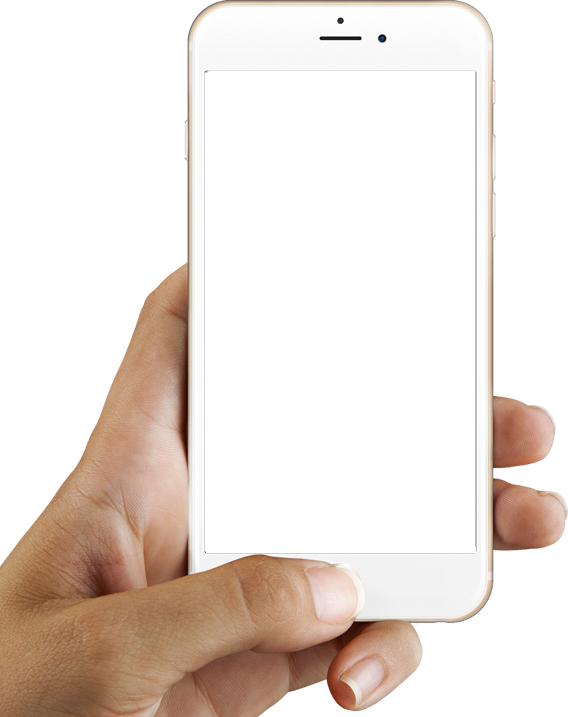 Launch Pad LLC shall have the right to bar your access to and use of the Site(s) or its other products or services if it has reasonable grounds to believe that you have provided untrue, inaccurate, not current, or incomplete information to Launch Pad LLC, or for any other reason it, in its sole discretion, deems appropriate. You agree that if you are ordering or purchasing products on behalf of a company, that you have sufficient authority to bind that company to the Terms and Conditions. You agree that your placement of an electronic order on the Site(s) is sufficient to satisfy any applicable Statute of Frauds, and no further writing is required. Launch Pad LLC may reject orders where the stated delivery address is outside the United States and Canada. If stated, Launch Pad LLC will add applicable shipping and handling fees. Launch Pad LLC reserves the right without prior notice to discontinue or change specifications and prices on products offered on and outside of the Site(s) without incurring any obligation to you. Launch Pad LLC's descriptions of, or references to, products not owned by Launch Pad LLC on and outside of the Site(s) do not imply endorsement of that product, or constitute a warranty, by Launch Pad LLC. the United Nations Convention on the International Sale of Goods shall not apply to any purchase or sale, and Launch Pad LLC expressly opts out of such application. Unless otherwise noted, Launch Pad LLC will use commercially reasonable efforts to ship products within a reasonable time after receipt of your properly completed order. Although Launch Pad LLC may provide delivery or shipment timeframes or dates, you understand that those are Launch Pad LLC good-faith estimates and may be subject to change. You further understand that product availability may be limited and particular products may not be available for immediate delivery, in which case the products will be delivered when they become available. Launch Pad LLC shall not be liable for any loss, damage, cost, or expense related to any delay in shipment or delivery. With regards to any product made available to you on an auto-renew or monthly (or other period) subscription as sold through the Site(s) or otherwise (including any free trial product) (the "Product"), the default term of our agreement shall be for so long as we make the Product available to you. IF YOU HAVE PROVIDED US WITH A VALID CREDIT CARD NUMBER OR AN ALTERNATE PAYMENT METHOD, YOUR SUBSCRIPTION WILL BE AUTOMATICALLY RENEWED (AND CHARGED TO THE ACCOUNT YOU HAVE PROVIDED) FOR ANOTHER TERM AT THE EXPIRATION OF YOUR CURRENT TERM, WHENEVER LOCAL REGULATIONS ALLOW, FOR A FEE NO GREATER THAN OUR THEN-CURRENT PRICE, EXCLUDING PROMOTIONAL AND DISCOUNT PRICING. The new term will be for the same duration as the expired term unless otherwise specified at time of renewal. This renewal will be processed (and your card charged) within 30 days prior to the expiration of the term and each period thereafter. IF YOU DO NOT DESIRE TO HAVE YOUR SUBSCRIPTION AUTOMATICALLY RENEWED, YOU MUST, PRIOR TO THE EXPIRATION OF YOUR SUBSCRIPTION TERM, INFORM US OF YOUR INTENTION NOT TO RENEW YOUR SUBSCRIPTION TO THE PRODUCT BY CALLING OUR CUSTOMER SERVICE. CERTAIN WARRANTIES WITH RESPECT TO PARTICULAR PRODUCTS FOR SALE ON OR OUTSIDE THE SITE(S) MAY BE APPLICABLE THROUGH MANUFACTURERS' WARRANTIES, THOUGH NOT THROUGH LAUNCH PAD LLC. SEE THE WARRANTIES INCLUDED IN THE DOCUMENTATION ALONG WITH THE PRODUCTS FOR FURTHER DETAILS REGARDING WARRANTIES PROVIDED BY MANUFACTURERS OF PRODUCTS AVAILABLE THROUGH OR OUTSIDE THE SITE(S). YOU EXPRESSLY AGREE THAT USE OF THE SITE(S) AND OTHER PRODUCTS AND SERVICES OF LAUNCH PAD LLC IS AT YOUR SOLE RISK. YOU UNDERSTAND AND AGREE THAT THE SITE(S) AND THE INFORMATION, SERVICES, PRODUCTS, AND MATERIALS AVAILABLE THROUGH IT AND OTHERWISE ARE PROVIDED ON AN "AS-IS" AND "AS-AVAILABLE" BASIS. 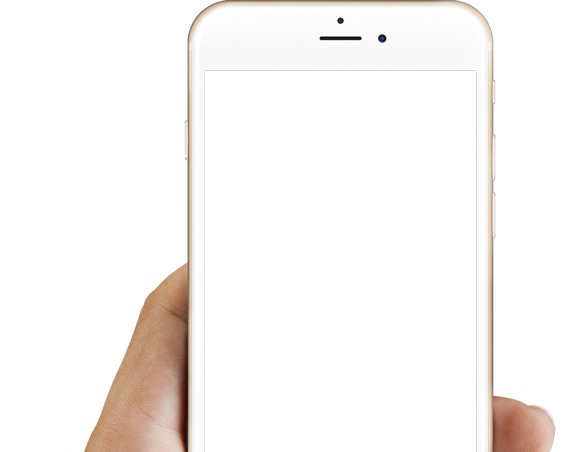 YOU ACKNOWLEDGE THAT LAUNCH PAD LLC DOES NOT CONTROL IN ANY RESPECT ANY ADVERTISEMENTS, PRODUCT DESCRIPTIONS, PRODUCTS, OR CONTENT OFFERED BY THIRD PARTIES ON OR THROUGH THE SITE(S), INCLUDING, BUT NOT LIMITED TO, INFORMATION OR PRODUCTS PROVIDED BY LICENSE TO LAUNCH PAD LLC FROM THIRD PARTIES. EXCEPT AS OTHERWISE AGREED IN WRITING, LAUNCH PAD LLC AND ITS AFFILIATES ASSUME NO RESPONSIBILITY FOR AND MAKE NO WARRANTY OR REPRESENTATION AS TO THE ACCURACY, CURRENCY, COMPLETENESS, RELIABILITY, OR USEFULNESS OF CONTENT OR PRODUCTS (INCLUDING PRODUCT DESCRIPTIONS) DISTRIBUTED OR MADE AVAILABLE BY THIRD PARTIES THROUGH OR OUTSIDE OF THE SITE(S). NOR DOES LAUNCH PAD LLC MAKE ANY WARRANTY AS TO THE RESULTS THAT MAY BE OBTAINED FROM USE OF THE SITE(S), ANY PRODUCTS OR SERVICES OFFERED OR SOLD THROUGH THE SITE(S), OR ITS CONTENT. ALTHOUGH LAUNCH PAD LLC STRIVES TO PREVENT THE INTRODUCTION OF VIRUSES OR OTHER DESTRUCTIVE MATERIALS TO THE SITE(S), LAUNCH PAD LLC DOES NOT WARRANT, GUARANTEE, OR MAKE ANY REPRESENTATIONS THAT THE SITE(S) IS FREE OF DESTRUCTIVE MATERIALS. IN ADDITION, LAUNCH PAD LLC DOES NOT WARRANT THAT ACCESS TO THE SITE(S) WILL BE UNINTERRUPTED, TIMELY, SECURE, OR ERROR-FREE, OR THAT DEFECTS, IF ANY, WILL BE CORRECTED. LAUNCH PAD LLC DISCLAIMS ANY WARRANTY OR REPRESENTATION THAT CONFIDENTIALITY OF INFORMATION TRANSMITTED THROUGH THE SITE(S) WILL BE MAINTAINED. TO THE EXTENT ALLOWED BY LAW, LAUNCH PAD LLC DISCLAIMS ALL WARRANTIES AND CONDITIONS NOT EXPLICITLY STATED HEREIN. SOME JURISDICTIONS DO NOT ALLOW THE LIMITATION OR EXCLUSION OF CERTAIN WARRANTIES OR CONDITIONS, SO SOME OF THE ABOVE EXCLUSIONS MAY NOT APPLY TO YOU. IN NO EVENT, INCLUDING, WITHOUT LIMITATION, NEGLIGENCE, SHALL LAUNCH PAD LLC OR ITS AFFILIATES BE LIABLE FOR ANY DAMAGES, CLAIMS, OR LOSSES INCURRED (INCLUDING WITHOUT LIMITATION COMPENSATORY, INCIDENTAL, INDIRECT, SPECIAL, CONSEQUENTIAL, OR EXEMPLARY DAMAGES), HOWEVER CAUSED, AND UNDER ANY THEORY OF LIABILITY ARISING IN CONNECTION WITH: (I) THE SITE(S); (II) THE USE OR INABILITY TO USE THE SITE(S); (III) THE USE OF OR RELIANCE ON ANY CONTENT OR INFORMATION DISPLAYED IN OR ON THE SITE(S); (IV) THE PURCHASE OR USE OF ANY PRODUCTS THROUGH THE SITE(S) OR OTHERWISE; (V) UNAUTHORIZED ACCESS TO OR ALTERATION OR LOSS OF YOUR TRANSMISSIONS OR DATA OR OTHER INFORMATION THAT IS SENT OR RECEIVED; (VI) ERRORS, SYSTEM DOWN TIME, NETWORK OR SYSTEM OUTAGES, OR FILE CORRUPTION OR SERVICE INTERRUPTIONS; OR (VII) OTHERWISE UNDER THIS AGREEMENT/TERMS AND CONDITIONS, WHETHER OR NOT REASONABLY FORESEEABLE, EVEN IF LAUNCH PAD LLC OR ITS REPRESENTATIVES ARE ADVISED OF THE POSSIBILITY OF SUCH DAMAGES, CLAIMS, OR LOSSES AND NOTWITHSTANDING ANY FAILURE OF ESSENTIAL PURPOSE OF ANY LIMITED REMEDY. NOTWITHSTANDING ANYTHING TO THE CONTRARY CONTAINED HEREIN, LAUNCH PAD LLC'S LIABILITY TO YOU FOR ANY CAUSE OF ACTION OR CLAIM WHATSOEVER, AND REGARDLESS OF THE FORM OF THE ACTION, WILL AT ALL TIMES BE LIMITED TO THE AMOUNT PAID, IF ANY, BY YOU IN THE LAST 120 DAYS TO LAUNCH PAD LLC FOR ANY PRODUCTS SUPPLIED BY LAUNCH PAD LLC THROUGH YOUR USE OF THE SITE(S) OR OTHERWISE. LAUNCH PAD LLC WILL NOT BE LIABLE IN ANY AMOUNT FOR FAILURE TO PERFORM ANY OBLIGATION UNDER THESE TERMS AND CONDITIONS IF SUCH FAILURE IS CAUSED BY THE OCCURRENCE OF ANY UNFORESEEN CONTINGENCY BEYOND ITS REASONABLE CONTROL, INCLUDING, WITHOUT LIMITATION, INTERNET OUTAGES, COMMUNICATIONS OUTAGES, FIRE, FLOOD, OR WAR. The Site(s) are controlled, operated, and administered by Launch Pad LLC from its offices within the United States of America. Launch Pad LLC makes no representation that materials on the Site(s) are appropriate or available for use at other locations outside of the United States, and access to them from territories where the contents or products available through the Site(s) are illegal is prohibited. You may not use the Site(s) or export the content or products in violation of U.S. export laws and regulations. If you access the Site(s) from a location outside of the United States, you are responsible for compliance with all local laws. Notwithstanding any of these Terms and Conditions, Launch Pad LLC reserves the right, without notice and in its sole discretion, for any reason or no reason, to terminate your ability to use the Site(s) and to block or prevent future access to and use of the Site(s). You agree that Launch Pad LLC shall not be liable for any termination of your use of or access to the Site(s). Only you and Launch Pad LLC shall be entitled to enforce these Terms and Conditions. No third party shall be entitled to enforce any of these Terms and Conditions. These Terms and Conditions shall be governed by and construed in accordance with the laws of the State of Colorado, without resort to its conflict of law provisions. You agree that any action at law or in equity arising out of or relating to the Terms and Conditions or your use of the Site(s) shall be filed only in the Superior Court of Denver County, Colorado, or the United States District Court for the Central District of Colorado, and except as stated herein you hereby irrevocably and unconditionally consent and submit to the exclusive jurisdiction of such courts over any suit, action, or proceeding arising out of the Terms and Conditions. Notwithstanding the above, any controversy or claim related to this Agreement shall be resolved exclusively by arbitration in accordance with the Federal Arbitration Act (Title 9, U. S. Code) (the "Act"). The Act will apply even though this Agreement provides that it is governed by the laws of Colorado. The arbitration shall be administered by JAMS and conducted in Denver, Colorado. All Claims shall be determined by one arbitrator; however, if Claims exceed Five Million Dollars, upon the request of either Launch Pad LLC or You, the Claims shall be decided by three arbitrators. All arbitration hearings shall commence within ninety (90) days of the demand for arbitration and close within ninety (90) days of commencement and the award of the arbitrator(s) shall be issued within thirty (30) days of the close of the hearing. However, the arbitrator(s), upon a showing of good cause, may extend the commencement of the hearing for up to an additional sixty (60) days. The arbitrator(s) shall provide a concise written statement of reasons for the award. The arbitration award may be submitted to any court having jurisdiction to be confirmed and enforced. The arbitrator(s) will have the authority to decide whether any Claim is barred by the statute of limitations and, if so, to dismiss the arbitration on that basis. For purposes of the application of the statute of limitations, the service on JAMS under applicable JAMS rules of a notice of Claim is the equivalent of the filing of a lawsuit. Any dispute concerning this arbitration provision or whether a Claim is arbitrable shall be determined by the arbitrator(s). The arbitrator(s) shall have the power to award legal fees pursuant to the terms of this Agreement. This paragraph does not limit the right of Braintecs to: (i) exercise self-help remedies, such as, but not limited to, setoff; (ii) initiate judicial or non-judicial foreclosure against any real or personal property collateral; (iii) exercise any judicial or power of sale rights, or (iv) act in a court of law to obtain an interim remedy, such as, but not limited to, injunctive relief, writ of possession or appointment of a receiver, or additional or supplementary remedies. The prevailing party in any action or arbitration related to these Terms and Conditions shall be entitled to its reasonable attorney fees and costs. The Terms and Conditions constitute the entire agreement between Launch Pad LLC and you with respect to your use of the Site(s), your purchase of products and services through the Site(s), and as applicable any products or services of Launch Pad LLC. Any cause of action you may have with respect to the Site(s) or Launch Pad LLC products or services must be commenced within one (1) year after the claim or cause of action arises, notwithstanding any statutes of limitation to the contrary. Any failure by Launch Pad LLC to enforce or exercise any provision of the Terms and Conditions or related right shall not constitute a waiver of that right or provision. The section titles used in the Terms and Conditions are purely for convenience and carry with them no legal or contractual effect. Nothing in these Terms and Conditions will be construed as creating a joint venture, partnership, employment, or agency relationship between you and Launch Pad LLC, and you do not have any authority to create any obligation or make any representation on Launch Pad LLC's behalf. You may not assign or transfer any rights or obligations of these Terms and Conditions, by operation of law or otherwise, without Launch Pad LLC's written consent. Subject to the foregoing, these Terms and Conditions will be binding on, inure to the benefit of, and be enforceable against you and Launch Pad LLC and their respective successors and assigns.